'Vote remain' banner in Kirk Deighton, North Yorkshire. The United Kingdom European Union membership referendum took place on 23 June 2016 in the UK and Gibraltar. It was to decide whether the United Kingdom would stay in the European Union (EU). The referendum ended with 51.9% of votes in favour of leaving the EU. On 24 June, the then Conservative Party leader and Prime Minister David Cameron announced that he would resign. He was replaced on 13 July by Theresa May. Members of the Remain campaign wanted the United Kingdom to stay in the European Union. Political parties that wanted the UK to stay in the EU include the Labour Party, the Liberal Democrats  and the Scottish National Party. They said that being in the EU gave the UK many advantages in trade. Prime Minister David Cameron supported staying in the EU, but the Conservative Party was neutral. It was up to each MP to have their own view. Other well-known Conservatives who wanted to remain in the EU include George Osborne, Theresa May and Philip Hammond. Members of the leave campaign, commonly called Brexit, wanted the UK to leave the European Union. Political parties who supported leaving the EU include United Kingdom Independence Party,, the Respect Party and many members of the Conservative Party. Those who supported "leave" were especially concerned about the EU's "open border" policies and mass migration. Some well known members of the Conservative party who wanted to leave the EU included Iain Duncan Smith, Michael Gove and Boris Johnson. Shortly after the results were announced, David Cameron said that he would resign by October 2016. After a leadership election, Theresa May became Prime Minister on 13 July. The Scottish government announced on 24 June 2016 that they were planning to hold a second independence referendum. Northern Ireland politician Martin McGuinness also called for an Irish reunification referendum. A movement for London independence even occurred, with an online petition reaching thousands of signatures. Theresa May officially triggered Article 50 on 29 March 2017. This means that negotiations have started between the UK government and the European Union. These talks are expected to last 2 years and after they have finished the UK will be out of the EU. Wikimedia Commons has media related to United Kingdom European Union membership referendum. ↑ Erlanger, Steven (23 June 2016). "Britain Votes to Leave E.U. ; Cameron Plans to Step Down". The New York Times. Retrieved 24 June 2016. ↑ McCann, Kate; Hughes, Laura (24 June 2016). "EU referendum live: Boris Johnson hails 'glorious opportunity' of Brexit as David Cameron resigns". The Telegraph. Retrieved 24 June 2016. ↑ Staff writer. 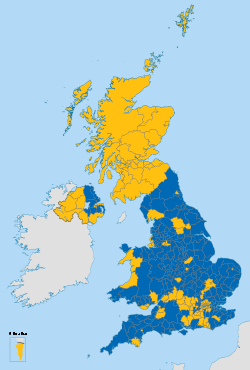 "EU Referendum Results". BBC News. BBC. Retrieved 24 June 2016. ↑ "Brexit: David Cameron to quit after UK votes to leave EU". BBC New. 24 June 2015. Retrieved 24 June 2016. ↑ Wintour, Patrick (2 June 2015). "Andy Burnham pushes Labour to set up separate pro-European Union campaign | Politics". The Guardian. Retrieved 12 June 2015. ↑ Patrick Wintour. "Alan Johnson to head Labour Yes campaign for EU referendum | Politics". The Guardian. Retrieved 18 June 2015. ↑ Staff writer (9 May 2014). "Nick Clegg: Pro-Europeans are the real reformers now". libdems.org.uk. Liberal Democrats. Retrieved 12 June 2015. ↑ Staff writer (2 June 2015). "Nicola Sturgeon warns of EU exit 'backlash'". BBC News. BBC. Retrieved 12 June 2015. ↑ Hope, Christopher (21 September 2015). "Conservative Party to stay neutral during EU referendum". The Telegraph. Retrieved 21 February 2016. ↑ UKIP. "Home page". ukip.org. UK Independence Party. ↑ R T (22 February 2016). "Respect to campaign to leave the EU". respectparty.org. Respect Party. ↑ "Official result of the EU Referendum is declared by Electoral Commission in Manchester". The Electoral Commission. 24 June 2016. Retrieved 24 June 2016. ↑ "Brexit: Petition for second EU referendum rejected". BBC News. 9 July 2016. Retrieved 9 July 2016. ↑ Laura Kuenssberg. "'No turning back' on Brexit as Article 50 triggered". BBC News. Retrieved 29 March 2017. This page was last changed on 23 January 2019, at 03:46.